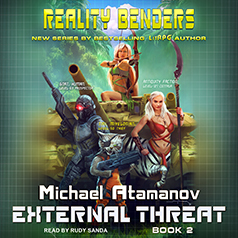 Michael Atamanov presents Book 2 of the Reality Benders series. The countdown timer continues to tick, but Earth is still not ready to repel an invasion from space. Gnat is on his voyage with the Shiamiru, all the while trying to find backup for humanity among the great spacefaring races. After all, based on what he's already seen, he knows not to count on the good sense of his own kind. Even facing an external threat, the people of our Earth cannot see past their internal squabbles and come together to fight as one. Gnat does not expect gratitude from his leaders for taking such matters into his own hands, but when have laws and rules ever stopped our intrepid hero before?